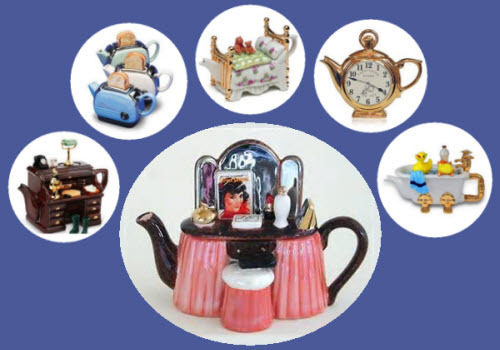 Toasters, alarm clocks, vanity tables, desks full of clutter, beds, and bathtubs are some of the household items immortalized as teapots. The everyday and mundane become teaworthy vessels (hee!) and lend an aura of yesteryear with every cuppa. They are decorative on the shelf, and some can even be used for steeping and serving tea. 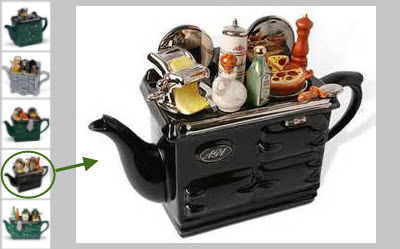 The racing car teapot and the travel trailer teapot are just two examples of teapots that are really going places. A pink purse, a wicker basket with an old-time movie camera on top, upright pianos (complete with piano seats), the iconic British red call box (phone booth), an espresso machine, a lighthouse, and much more can be found to use to steep up your tea and serve it while bringing you a smile! Cats are rather popular with tea drinkers, if the postings I see online are any indicator. This Chester the Cat Teapot not only appeals to the feline side of our natures but brings to mind such tea parties as that one hosted by The Mad Hatter in Alice in Wonderland. Horses, dogs, fish, frogs, ladybugs, and other members of the fauna clan are also featured. No matter your taste and inclination, you will find a furry friend (or scaly or slimy) from which to pour your tea. Whichever design you choose, your tea time will certainly be a special one!